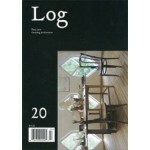 Autumn edition of contemporary urban architecture journal Log. With a cover story from editor Cynthia Davidson about the neglect of the Melnikov House – an icon of 1920s Constructivist architecture in Moscow – the issue then opens its curatorial theme with UCLA lecturer Sylvia Lavin's essay on showing architectural work. The topic is developed in more than 20 articles. Autumn edition of contemporary urban architecture journal Log. With a cover story from editor Cynthia Davidson about the neglect of the Melnikov House – an icon of 1920s Constructivist architecture in Moscow – the issue then opens its curatorial theme with UCLA lecturer Sylvia Lavin's essay on showing architectural work. The topic is developed in more than 20 articles, including Eve Blau's 'Curating Architecture with Architecture', Kurt W. Forster’s 'Arguments for an Architecture of Display', Kayako Ota's 'Curating as Architectural Practice', and Henry Urbach's 'Exhibition as Atmosphere'. Includes free postcard of Konstantin Melnikov's studio.